An 8-5 win over Japan’s Tori Koana (4-7) on Friday morning at the North Bay Memorial Gardens ran Team Canada’s win streak to 11 and locked up first place in the round-robin standings for skip Jennifer Jones, vice-skip Kaitlyn Lawes, second Jill Officer, lead Dawn McEwen, alternate Shannon Birchard, team coach Wendy Morgan and national coach Elaine Dagg-Jackson. 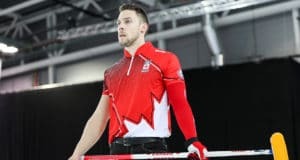 Still on the agenda — Canada’s round-robin finale later Friday (7 p.m., all times Eastern) against Jamie Sinclair of the United States (6-5), and then Saturday’s semifinals (time, opponent, TBC). Canada’s semifinal position was nailed down with a win over Italy late Thursday night, so Friday was a perfect opportunity to give Officer the morning off and allow Birchard to play her first full game of the 2018 Ford Worlds. “That was fun; I’m so happy they let me come out for a (full) game and Jill gets some rest before the playoffs,” said Birchard with a smile. Canada controlled the game, taking an 8-2 lead after six ends with a stolen deuce in the sixth. Japan managed to make it closer with single points in the seventh, eighth and ninth ends, but the final result wasn’t in doubt. With first place comes guaranteed last-rock advantage in the playoffs. 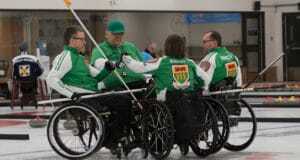 “It’s huge to have the hammer and be able to come out firing in the first end of the semifinal,” said Birchard. Canada will be joined by Sweden’s Anna Hasselborg (10-1) in the semifinals (set for 2 p.m. and 7 p.m. on Saturday), and they will play the winners of the quarter-final matches on Saturday at 10 a.m. that will feature the third-place team against the sixth-place team and fourth against fifth. Canada will play the lowest-seeded winner of those quarter-final matchups. In other action on Friday morning, Anna Kubešková of the Czech Republic took a big step toward her country’s first-ever playoff berth at the women’s worlds with a stolen 8-6 win over the U.S. The teams were tied 6-6 coming home but Sinclair was just heavy with her draw for the win, giving a stolen deuce to the Czechs. In the other games on Friday, China’s Yilun Jiang (5-6) scored four in the eighth end en route to a 10-9 win over Denmark’s Angelina Jensen (3-8), while Germany’s Daniela Jentsch (3-8) was a 10-6 winner over Switzerland’s Binia Feltscher (4-7). The 2018 Ford World Women’s Curling Championship continues with draws Friday at 2 p.m. and 7 p.m. (all times ET).